Note: Below is an archive of past referendum results. If there is a specific piece of information you are looking for that is missing below, please email Ron Bauman and she will do her best to assist you. Do you support the transfer of a $2.83 per credit fee from the Brock Student Sexual Violence Support Centre (A Safer Brock) to fund an on-campus sexual violence education and support service provider as per the Memorandum of Understanding? Do you support the creation of a $36.50 per credit levy that would result in the building of the new Student Centre as per the Memorandum of Understanding? The collection of the fee shall commence once the new Student Centre is open. Do you support the creation of a $1.25 per credit fee Ombuds Levy starting May 2019, as per the Memorandum of Understanding? Do you support the creation of a $1.75 per credit fee to fund Brock University Student Radio (CFBU) starting Spring 2019, as per the Memorandum of Understanding? Do you support the recall of Peter Henen, Vice-President External Affairs, from elected office pursuant to Article XII, section 1 of the Constitution of the Brock University Students’ Union, Inc., effective immediately upon the success of this referendum? Do you support the creation of a $100 annual Student Engagement levy, to be charged to all incoming first year undergraduate students starting Fall 2019, as per the Memorandum of Understanding? Do you support the creation of a $17 per credit fee over a period of five (5) years (commencing in 2020) that would result in the expansion of the Zone fitness centre, after which the fee will drop to a $1.25 per credit to cover maintenance and operations as outlined in the Memorandum of Understanding? The collection of the fee shall commence once the expansion is complete (expected completion is September 2020). Do you support the creation of a $1.75 per credit Brock University Student Radio Levy starting Spring 2018 as outlined in the Memorandum of Understanding? 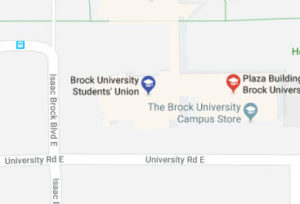 Do you support the continuation of a $2.75 per credit fee to fund the Brock Student Sexual Violence Support Centre, as per the Memorandum of Understanding? Do you support a $3.97 per credit increase to the Student Justice Centre fee ($0.91 per credit to $4.88 per credit) starting Spring 2018 as outlined in the Memorandum of Understanding? Do you support a $3.97 increase to the Student Justice Centre fee ($0.91 to $4.88) starting spring 2018 as outlined in the Memorandum of Understanding? Do you support the removal of the $1.50 per credit fee for the Ontario Public Interest Research Group (OPIRG) effective May 1st, 2018?